The ongoing crackdown on major suppliers of narcotic drugs by the Anti-Narcotics Unit (ANU) led to the arrest of eight people said to be part of the ring. At least six of the suspects were arrested on Sunday in Kicukiro District. Another drug dealer was arrested in the same district the previous day. According to Chief Inspector of Police (CIP) Marie Gorett Umutesi, one of the suppliers arrested in the Sunday operation in Kicukiro identified as Jean de Dieu Uwamungu was found in possession of 3, 350 pellets of cannabis. 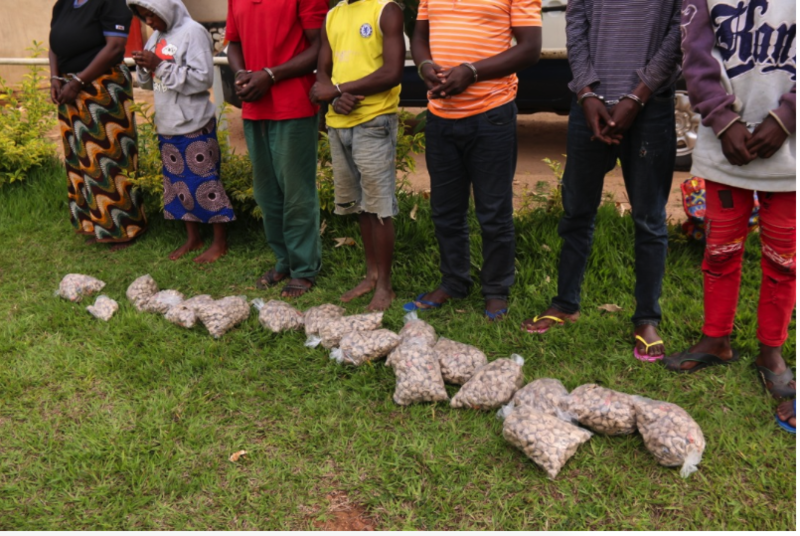 “The five suspects were arrested in a targeted operation conducted in Ruhuka Village, Karambo Cell of Gatenga Sector after thorough follow up on their criminal doings largely based on the information we receive from the people,” CIP Umutesi said. She identified other suspects as Fulgence Hirwa, Claver Ndatira, Angelique Kwishaka, Petronile Mukagakwaya and François Ahimpereyendeze (arrested Saturday in Kanombe Sector, Kabeza Cell). “The Anti-Narcotics Unit also impounded a motorcycle; RE 278E which was being used especially by Fulgence and Kwishaka to distribute cannabis to their retailers or customers in various parts of the City of Kigali,” CIP Umutesi said. Another suspected supplier identified as Innocent Ndayisenga alias Ganda, 36, was taken into custody on March 16, in Rulindo District, Shyorongi Sector, Bugaragara Cell in Gatwa Village with 4000 rolls of cannabis. Ndayisenga was at the time transporting the narcotics on his motorcycle—RC 585F—which was also impounded. The continuous crackdown spearheaded by the Rwanda National Police (RNP) Anti-Narcotics Unit is largely focused on identifying compiling names and apprehending major suppliers. A fortnight ago, four other drug traffickers were also arrested in Gasabo and Kayonza districts with varied quantities of cannabis.